Are you a new bride but don't know how to please your husband's hungry belly? 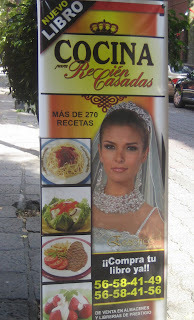 Well don't worry, this new recipe book advertised outside of one Mexico City boutique store will solve all of your newlywed worries. I saw this sign a few months ago and thought, "What year is it?" When it disappeared from the sidewalk one day I thought someone finally came to their senses. But today on my way back home, there it was again in full machismo force.